Appealing to the younger set, Seuss Landing is located where characters of all stripes and shapes come to life at Universal Orlando Resort. The area is themed on the whimsical world of Dr. Seuss and includes rides, attractions, live shows, and dining that bring the beloved books and stories to life. Seuss Landing is located in the Islands of Adventure theme park, which, along with its sister theme park Universal Studios Orlando, the CityWalk shopping-and-entertainment district and ​five on-site resorts, make up the Universal Orlando Resort. What's Special About Seuss Landing? Legions of kids and parents love the Dr. Seuss books, and Seuss Landing does a fabulous job bringing characters and wacky ambiance to life. 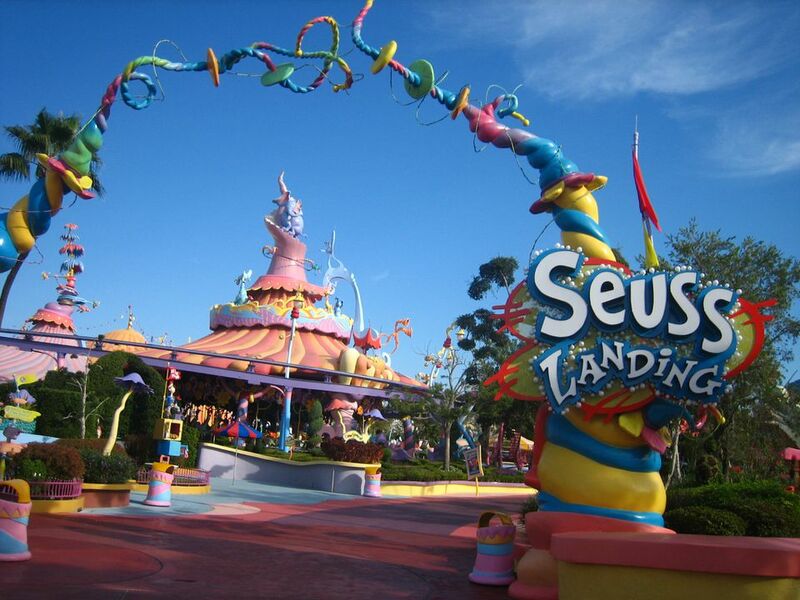 For families visiting the Islands of Adventure theme park, Seuss Landing is ground zero for little kids. Seuss Landing gives the youngest kids their own delightful 10-acre zone. The fun gets even better at Grinchmas time. Islands of Adventure is also known for thrill coasters like The Hulk that score big hits with older kids. While Universal Studios Orlando also features rides and attraction for little kids, Seuss Landing offers the biggest and best collection in one place. The Cat in the Hat Ride. Similar to Disney's Winnie the Pooh ride, where visitors are whisked through the pages of a book. See what mischief Thing One and Thing Two can do! High in the Sky Seuss Trolley Train Ride: a track rises up to 20 feet, traveling through several book-based scenes, and giving a birds-eye view of Seuss Landing attractions. The Caro-Seuss-el merry-go-round, with creatures who can turn their heads, blink, and wiggle their ears. One Fish, Two Fish, Red Fish, Blue Fish: Kids steer their fish with a joystick, while they get directions on how to fly. Admittedly, it's a bit odd to see the Lorax--an icon of anti-commercialism--in the middle of a theme park. But generally with theme parks one parks philosophy at the entrance gate; so you may as well relax, and enjoy the Truffula trees with your kids. As for the Grinch: You might not see much him in April but during the holiday season at Universal Orlando--watch out. Most years, during the "who-lidays", Seuss Landing turns into Whoville for a Grinchmas celebration. Meet the Grinch in his lair, and his trusty dog Max; enjoy the Whoville Whobilation show every night; catch the tree-lighting of a giant Seuss-style Christmas tree. Tip: You can buy Grinch-ie Christmas ornaments year-round in this park. E.T. Adventure is one of the very few Universal Studios Florida rides geared to younger kids. This ride is located is in the Woody Woodpecker Kid Zone, which also offers Fievel's Playground, with tubes, slides, a giant spider web, and a water slide all scaled to little kids. You'll also find A Day in the Park with Barney; Curious George Goes to Town; and the Animal Actors on Location live show. If possible stay at an on-site hotel at Universal Orlando Resort, which will give you nice digs plus the best front-of-the-line ride access. Each of the resorts has a fantastic pool and free water-taxi shuttles to the theme parks. Be aware that some rides have minimum heights for kids. If you want to visit Islands of Adventure or ride the Hogwarts Express, you'll need dual-park passes. Universal Studios Florida offers major seasonal fun at different times of the year. The most popular event, Halloween Horror Nights, takes place in September and October and requires a separate ticket.